Unaccountably, Percy Grainger has remained on the margins of both American music history and twentieth-century modernism. This volume reveals the well-known composer of popular gems to be a self-described ’hyper-modernist’ who composed works of uncompromising dissonance, challenged the conventions of folk song collection and adaptation, re-visioned the modern orchestra, experimented with ’ego-less’ composition and designed electronic machines intended to supersede human application. Grainger was far from being a self-sufficient maverick working in isolation. Through contact with innovators such as Ferrucio Busoni, Léon Theremin and Henry Cowell; promotion of the music of modern French and Spanish schools; appreciation of vernacular, jazz and folk musics; as well as with the study and transcription of non-Western music; he contested received ideas and proposed many radical new approaches. 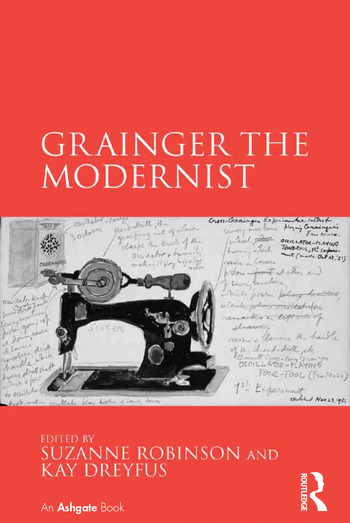 By reappraising Grainger’s social and historical connectedness and exploring the variety of aspects of modernity seen in his activities in the British, American and Australian contexts, the authors create a profile of a composer, propagandist and visionary whose modernist aesthetic paralleled that of the most advanced composers of his day, and, in some cases, anticipated their practical experiments. Suzanne Robinson teaches Australian music history at the University of Melbourne and has published studies of modernist British and American composers in journals including Cambridge Opera Journal; American Music; Journal of the Society for American Music; and Musicology Australia. Her article on the interactions between Grainger and Cowell appeared in Musical Quarterly (2011) and an article on Grainger’s 1934-35 tour of Australia is published in Musicology Australia (2013).She is currently writing a biography of Peggy Glanville-Hicks supported by the State Library of NSW and the Australia Council, and is Series Editor for Australasian Music Research at Lyrebird Press. Kay Dreyfus is an Adjunct Research Fellow in the History Program (SOPHIS) at Monash University and Dean's Research Fellow in the School of Graduate Studies, RMIT University. She was Curator and Research Fellow at the Grainger Museum between 1974 and 1987. She edited The Farthest North of Humanness: Letters of Percy Grainger 1901-14 (South Melbourne, 1985), compiled the Museum’s catalogues of the music of Percy Grainger and completed a bibliographic study, Percy Grainger’s Kipling Settings: A Study of the Manuscript Sources (Nedlands, WA, 1980). In 1988 she was awarded the International Percy Grainger Medal for her contribution to Grainger scholarship. Since 2000, she has commissioned and guest-edited themed issues of ten major Australian and overseas journals.